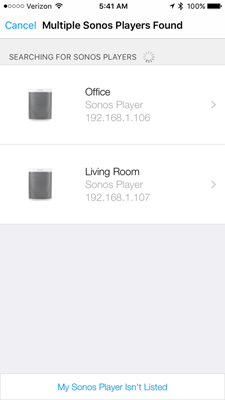 It takes a few steps to get all of the new features this set up, starting with discovering your Sonos speakers. You can add up to four speakers; they all should be discovered, but you will need to go back and add them one at a time (those already added will be greyed out). If you have trouble setting up your Sonos speakers, check http://www.insteon.com/support-knowledgebase/ for a solution. Once you’ve added your Sonos speakers, you can immediately use the Sonos transport controls within the iOS app (Play, Pause, skip, volume up or down, next, previous, etc.). In order to reap the full benefits of Sonos integration with Insteon, you’ll need to setup presets using the Insteon App in combination with the Sonos app. Currently, up to 10 presets are supported (and these are shared among all Sonos speakers controlled by Insteon). Also, only Pandora stations are officially supported at this time. I don’t know if other music services will be added over time. 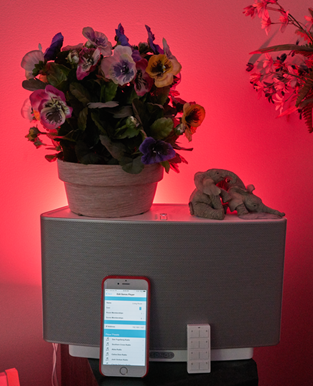 To get started adding presets, the first step is to open the Sonos App on your iPhone and start playing the station you want to configure in the Insteon app. 1. Open the Sonos App and play the station you want to use as an Insteon preset. 2. 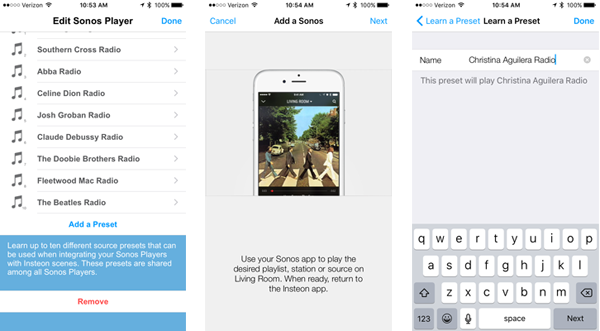 Go to Devices, Edit Devices, and select a Sonos player and then select Add a Preset. 3. If the station you want is playing, tap Next when prompted. 4. Change the name if you don’t like what is automatically configured and then tap Done. This is a very big deal for me. Previously, I could set Sonos Alarms to wake me to music and separately set some schedules scenes in Insteon to turn on lights at the same time. With this new functionality, I’ve been able to create a scene that turns on lights and wake me to the Doobie Brothers Pandora station and use Insteon to schedule an ON time and and OFF time. 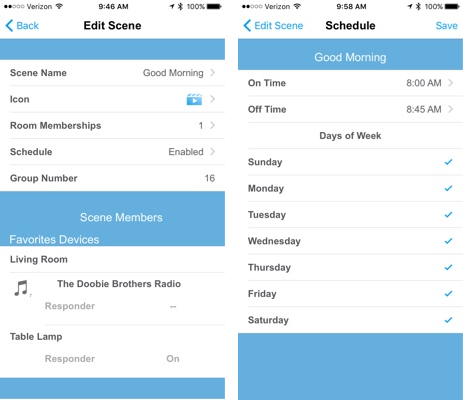 Once you’ve configured your presets, if you’re familiar with the Insteon App, it’s very easy to setup a scene that includes Sonos speakers, and then configure a schedule. I’ve got my two Sonos players grouped, using the Sonos App on my iPhone so I’ve got the same music playing upstairs and downstairs. My home office is a loft room that shares a cathedral ceiling with the master bedroom, and the Office Sonos sits on the railing and fills both the loft and the bedroom with sound. I don’t think I’ve had a better “wake up and get out of bed” alarm, ever. In addition to all the above, Insteon devices such as wireless mini remotes, keypads, plug in modules/on off switches, etc. can be used to control Sonos functions. Using an 8 button Insteon mini remote, you can assign a preset to each button and have an arm chair remote for your favorite 8 stations. 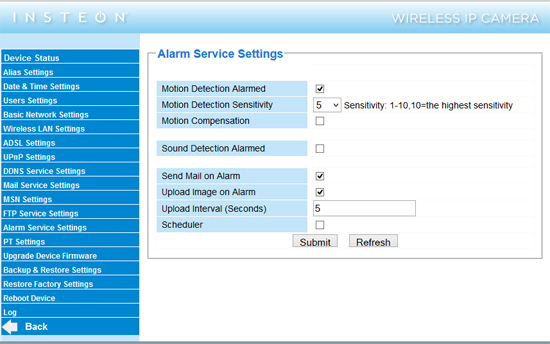 Or set up a motion sensor to trigger Sonos music. Bottom line, if you’re an Insteon user with Sonos speakers, all of this is coming your way in the very near future. Watch http://www.insteon.com/sonos/ for news. 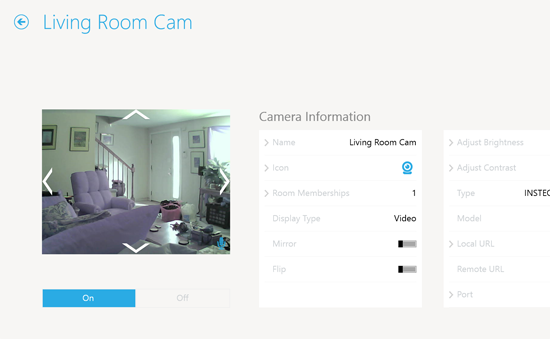 Abo ve image shows one of my cameras in the Windows 8.1 app interface. I can pan and tilt, etc. and also hear the audio on my Windows 8.1 devices. 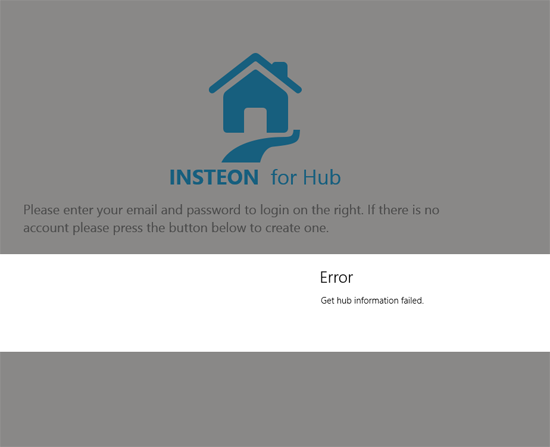 I was so looking forward to the release of the SmartHome Insteon App as I have multiple devices. I’ve been controlling them from the Insteon iPhone App, the web site at connect.insteon.com, and from a home made app I made myself. 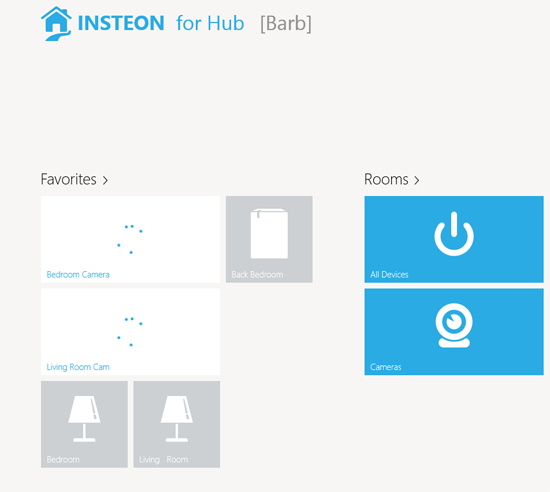 The app appeared a little while ago when I searched the Windows Store for Insteon. I immediately installed it. I tried from two computers and a tablet with the same bad results. 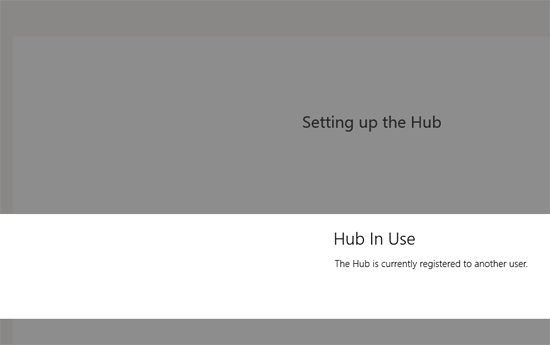 Next, I decided to see what would happen if i tried to set up a new account. 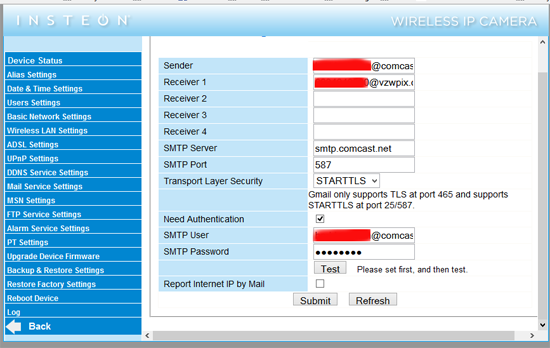 Strangely, after trying and failing to set up a new user, I was able to log in with the existing credentials. 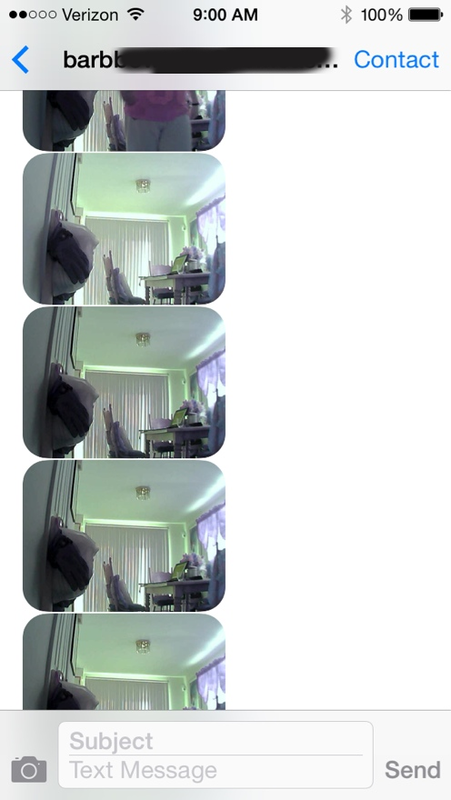 I can turn lights on and off, but the Insteon Cameras have not displayed. The cursor just spins forever. It doesn’t mater which screen I navigate to, same result. The quality of this long awaited app is disappointing to say the least. Fortunately, I have other options as I wrote about recently.